As you already know, fibromyalgia is chronic pain syndrome accompanied with cognitive changes, sleep disturbance, fatigue, mood changes and many other symptoms. 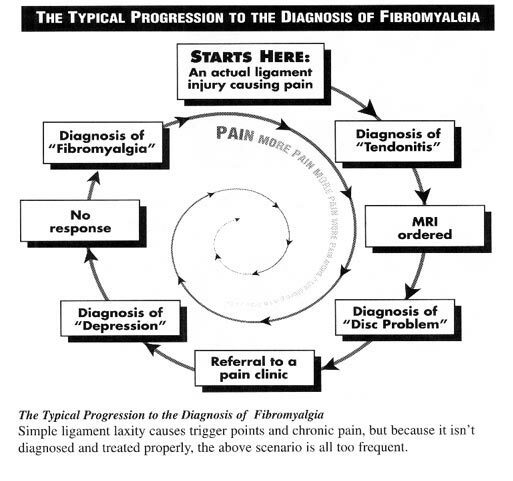 The fibromyalgia diagnosis is made to create a clinical evaluation, which will include attention to medical history, current health issues and complaints and physical examination. There is no particular confirmatory fibromyalgia test. Fibromyalgia can affect people of both genders and all ages. However, this condition is most prevalent in females. There is no particular study that examines the criteria for fibromyalgia diagnosis regarding the clinical presentation of its symptoms. The symptoms do not disappear, but wax and wane as time passes. 1 How is Fibromyalgia Diagnosed? 1.1 How to Diagnose Fibromyalgia in Patients with Widespread Pain? The physical fibromyalgia examination is within normal limits. This is specifically the case of musculoskeletal and neurological fibromyalgia. The exception here is for the tenderness of soft tissues in patients. These can include report of pain on and during examination. However the 2010 ACR diagnostic criteria have specified that the count of tender points is no longer part of fibromyalgia diagnosis. Other symptoms that may occur are those interpreted as touch allodynia and dysaesthesia. These are both unpleasant pain sensation after a stimulus that is not painful at all. These can occur but without other neurological findings. The examination of tender points is widely disputive as an objective fibromyalgia test. The diagnostic criteria that is established for the purposes of research cannot be applicable to an individual patient. Therefore, the 1990 ACR criteria for fibromyalgia diagnosis has required 11 out of 18 tender points to be present in the particular designated areas. These points are all located at sites of soft tissue and reflect somewhat of pain threshold reduction. They have to show variable reliability and do not have any underlying pathology regarding the tissue. When speaking of how to diagnose fibromyalgia, we are speaking of correct examination of tender points i.e. digital palpation, dolorimetry and myalgic scoring. The most commonly used method is digital examinations. In many cases, the tender points presence may associate with distress instead being a certain indicator of pain. The examinations mentioned above can actually conclude a fibromyalgia diagnosis only when checking a few selected points. How to Diagnose Fibromyalgia in Patients with Widespread Pain? There is no such thing as confirmed clinical diagnosis of fibromyalgia, so it is highly important that any unnecessary labaratory investigations should be avoided. Opposite of what many think, fibromyalgia is not an exclusion diagnosis. The laboratory testings should be strictly limited to blood count and a complete one, C-reactive protein, erythrocyte sedimentation rate, thyroid stimulating hormone and creatine kinase. These are all primarily used to rule out similar conditions to fibromyalgia which may also include hypothyroidism or the endocrine disease, myophaty, multiple sclerosis and rheumatic conditions such as polymyalgia rheumatic or early inflammatory arthritis. Additional testing is applied where appropriate and may include sleep evaluation or some kind of psychological evaluation. Many fibromyalgia patients will have reduced levels of vitamin D, but this does not have an effect on their chronic pain. Also, positive antinuclear antibody or ANA is present in about 10% of all fibromyalgia patients but does not really predict any future tissue disease. Screenings of consistent abnormalities in function of the immune system should be solely driven by clinical findings because there is no such abnormality been identified so far. The primary care has the main responsibility for both fibromyalgia diagnosis and management. Confirmation from a specialist is not required in all cases because physicians can rely on normal blood testing and combination of symptoms to diagnose this condition. Sometimes they use questionnaires in research setting, but they are not really clinically useful in practice. Diagnosing fibromyalgia early can save you lot of time, unnecessary investigations, lengthy treatment and costly medical care. Additionally, such diagnosis will focus the attention of your doctors towards managing the symptoms and improve the general function of your body. Only 2 of 91 patients develop other conditions as a result of fibromyalgia. The American College of Rheumatology has initially defined the concept of fibromyalgia in 1990. Later on, in 2010 this concept was further investigated and revised, by taking other symptoms into consideration, aside from the pain and the tender point examination. What was established was that fibromyalgia actually represents a condition characterized with many symptoms that can fluctuate in both intensity and persistence. There are certain conditions that may present similar symptoms to those of fibromyalgia, but can be easily identified with some clinical evaluations. Patients who suffer from inflammatory rheumatic conditions at an early stage, such as rheumatoid arthritis, systemic lupus erythematosus, inflammatory spondyloarthritis or myositis; may have body pain that looks similar as that of fibromyalgia. A single laboratory test such as raised ESR, positive ANA or positive rheumatoid factor is not sufficient evidence for the existence of damage in the connective tissue. Trigger points and localized pain are most commonly associated with myofascial pain syndromes. There are certain neurological conditions commonly characterized with body pain, too. These include neuropathies, multiple sclerosis and myopathies. Additionally, ill-defined pain can be accompanied with fatigue in the case of hypothyroidism. Another neurological condition that can present with pain is depression. However, fibromyalgia patients are more commonly diagnosed with local tenderness when compared to those who suffer from depression. Fibromyalgia can be diagnosed after an infectious illness. In most cases, the infection is viral, but an infectious aetiology is not really required as part of the routine. Certain symptoms from infectious diseases can mimic fibromyalgia and these include human immunodeficiency disease, Lyme disease and hepatitis C infection. Any testing must be decided based on the doctor’s suspicion of an infection. Certain medications such as lipid lowering agents that treat statins, aromatase inhibitors that treat breast cancer and osteoporosis and bone metastases treatment in the form of bisphosphonates can also cause fibromyalgia-like symptoms. A misdiagnosis may also be set because of other rheumatologic, neurological and medical illnesses. The doctor’s job is to recognize the co-association of these illnesses with the fibromyalgia diagnosis. Sometimes the fibromyalgia diagnosis may be delayed as result of poor recognition of the condition. This may be a delay on behalf of both the patients and the healthcare professionals and can greatly affect the health and the cost of the treatment. The patients who may suffer from fibromyalgia are first sent to a primary care physician. The fibromyalgia test and fibromyalgia diagnosis are set to create the ideal fibromyalgia treatment that should ideally remain in the primary care setting. When necessary, this may be transferred to a special care by a specialist. It is debatable which cases of fibromyalgia become advantageous from pharmacoeconomic perspective. This is the case because healthcare utilization and cost may be reduced or increased. If the healthcare professionals are reassured and trained to diagnose and treat people with fibromyalgia, the patients should ideally remain under their care in duration of all treatment. Fibromyalgia patients are referred to specialists if they suffer from atypical symptoms. Such symptoms can suggest different diagnosis or a confirmation of the primary fibromyalgia diagnosis. There are certain selected cases that require referral for psychological consultation or even a sleep evaluation. Many patients find care in multidisciplinary setting to be unrealistic and non desirable. These teams include many healthcare professionals such as nurses, kinesiologists, physiotherapists, social workers and psychologists. The underutilized nursing support for fibromyalgia patients should focus towards contributing to the patients health and well-being, in order to reduce the time of waiting for consultation and increase satisfaction in patients. If you are asking yourself the question do I have fibromyalgia, the right place to visit is your primary healthcare professional. Suffering from symptoms that are characteristic for fibromyalgia is not a sufficient indicator to assume that you have that condition. It is always the job of a professional to identify the cause of the symptoms and diagnose you with the correct condition or illness. As a result of the diagnosis, a proper treatment must be set in order to cure you from the condition. Unfortunately, in this case, there is no cure for fibromyalgia. However, with proper treatment, your doctor can improve your life and reduce the symptoms of the condition. Not following doctor’s orders and taking care of your health can cause you many troubles, especially because fibromyalgia comes together with painful symptoms that may lower your ability to function normally. This is why it is highly important that you visit the healthcare professional as soon as you experience pain or some of the other fibromyalgia symptoms. When it comes to this chronic condition, it is best to start treating it at an early stage.